In the heart of the Nigerien Sahel (Azawak region), far from any urban center, thousands of Fulbe Wodaabe nomads come together every year to celebrate their cultural identity in a vast ceremonial gathering named the Daddo. For seven days and seven nights, opposing ancestral lineages take part in a complex ritual courtship competition called the Geerewol. Under the strict control of their elders, elaborately ornamented young men made up with traditional face paint form lines to dance and sing. At the end of each dance, the young women of the opposing lineage come forward to designate the “most beautiful” male of the group. The ceremony is a ritualization of conflict, which probably replaces ancestral feuds and wars over women from opposing clans, and enables the Wodaabe to break the ceremony in peace after mutually recognizing their cultural uniformity. Each year, organizing the massive gathering becomes more and more difficult, due to the ongoing Sahel ecological crisis and droughts. But according to the Wodaabes, this traditional ceremony is the only opportunity for the nomadic lineages to gather and forge links despite their geographic dispersion. If the ceremony were to be stopped, it would signal to them the end of their society as a unique cultural entity. Fearing that the tradition may die out, Ouba Hassane, 40, and his wife Kedi, 39, chose to appear on screen and relate their experiences and understanding of the ritual. 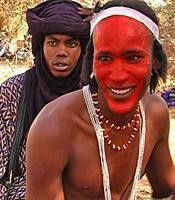 The film follows as Ouba teaches his son about Wodaabe traditions, myths, and religious beliefs. The couple’s commentary, along with that of the ceremony participants (dancers, young women, those in charge of the youth, societal elders) provide viewers with deep insight into the full occasion, extending beyond the dance. The Geerewol ritual has been the subject of several films and “studies” in the West since the 1950s. These have largely fueled a fantasy image of a ceremony in which “effeminate” men allow women the privilege of choosing male lovers for a night during a male beauty contest. Filmmaker and ethnomusicologist Sandrine Loncke, who spent ten years among the Wodaabe researching and filming, offers a compelling and powerful reframing of the events. She enables the Wodaabe themselves to decipher for us the subtext of the ritual, examining the full spectrum of gender, social, political, educational, and religious beliefs that underscore Wodaabe cultural identity and help ensure their survival. Keenly observed, beautifully filmed, and engagingly edited, the film will richly reward viewing and inspire discussion in a wide range of courses in cultural anthropology, African studies, gender studies, and ethnomusicology. The film is subtitled in English. It was produced and directed by Prof. Sandrine Loncke, of the University of Paris 8.